DESCRIPTION: Students will stitch a tile base that will be embellished with laser tattoo Kite beads, and completed with a Tierracast toggle. The Kite bead accents make this bracelet take flight! Materials in the kit: Czechmate 2-hole tiles, 2-hole Kite beads, size 15 seed beads, 2mm True2 fire polish rounds, clasp, jump rings and instructions. There will be three colorway kits for students to choose from. Kit Fee: $42 (paid to the instructor) Kit fee price reduction!! Hours: 3 - 5 p.m.
Leslie Pope, or you may know her better as “Twisted Sistah”, has a passion for beads and fibers that she loves to share with others. She became Twisted Sistah when she opened her traveling/web-based bead business in 2002 and hasn’t looked back since. 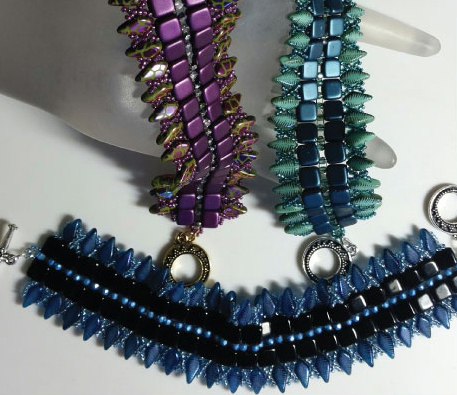 Her business is devoted to beads and fibers, and offers a wide range of seed beads, threads and supplies that support the creation of beaded wearable art. As Twisted Sistah, Leslie has exhibited and taught bead weaving classes up and down the East Coast, including Beadfest Philly. Leslie’s beaded creations have been featured in various magazines and books. You can also find her kits and tutorials on twistedsistahbeads.com, etsy.com/twistedsistahbeads, and in the BeadSmith.com online library of patterns.